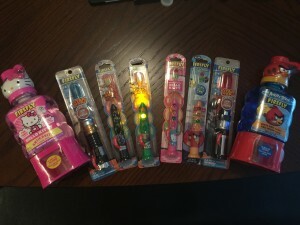 Firefly has some great toothbrushes that help kids enjoy brushing their teeth! I just received this e mail?Contest is not accepting any enteries ? Anything to get my kids to brush more thoroughly! They would love these cool toothbrushes and unique mouthwash packaging. ohhh these look so great- we love star wars especially! 🙂 i definitely want to try these- i bet these would make tooth brushing time infinitely less painful for ME!!! 😀 thanks for the great giveaway! These are adorable. What kid wouldn’t want to brush. I hope I win. My babies would love this prize pack, Thanks! My kids love these toothbrushes! We have bought them many times! My LO would love these, and they may encourage him to learn to brush on his own without reminders from Mom or Dad. These toothbrushes are so cool! My kids will love any of the Star Wars ones,the light saber ones are awesome! My grandsons would love them! Great prize package! We love our firefly toothbrushes! This is really neat! I find that the cooler the toothbrush the more they want to brush! How fun! My kiddos would love this. We love Firefly toothbrushes. Our 5 yr old has the Darth Vader and he had Yoda in the past. This sounds like a great package. Dental care is so important. Especially at a young age.